Say you have many worksheets, all in the same structure. You want to combine them into one worksheet. For example copying them underneath each other so that you can conduct lookups or insert PivotTables. 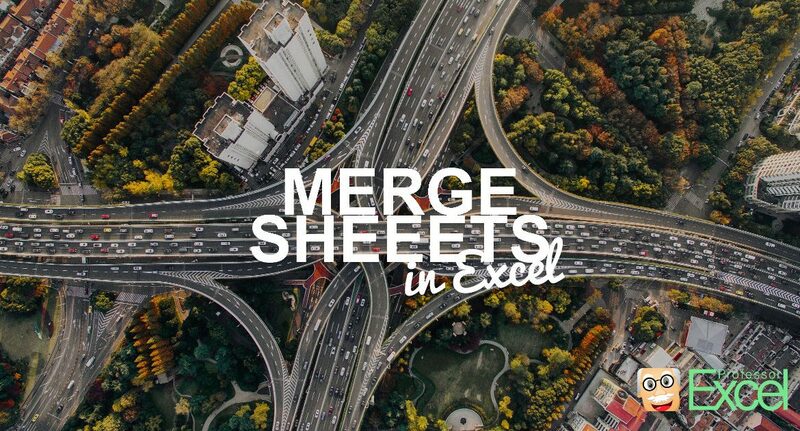 In this article, you learn four methods to merge sheets in Excel. Try to use keyboard shortcuts as much as possible. For example for selecting the complete worksheet (Ctrl + A), copying the data (Ctrl + C), navigating to your combined worksheet (Ctrl + Page Up or Page Down) and pasting the copied cells (Ctrl + V). Also the shortcut of pressing Ctrl on the keyboard and clicking on the little arrow in the left bottom corner of your worksheet could help. That way you jump to the first or last worksheet in your Excel workbook. This method is especially useful if you just have to merge sheets once. If you need to do it repeatedly (for example you get new inputs every week or month) it’s probably better to check out methods 2 to 4 below. 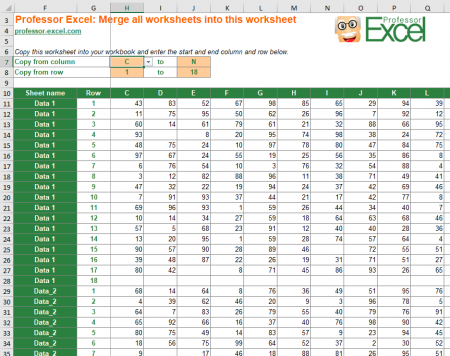 You can use Excel formulas to combine data from all worksheets. The main formula is INDIRECT. This method has some disadvantages, though. The INDIRECT formula in general is slow because it’s volatile. That means, it calculates each time Excel calculates something. Using a combination of INDIRECT is usually unstable and error prone. It takes some work to set up the INDIRECT formula. On the other hand, it has one major advantage: If you spend effort to set it up, this method is dynamic. That means when your input updates, the merged worksheet updates as well. Set up the INDIRECT formula for merging sheets. Column A contains the sheet name. Column B contains the row number. Starting from Column C, you should add the column letters. So let’s assume that you want to get the value from cell A1 of Sheet1. You would need then all the parts ‘Sheet1’, column ‘A’ and row ‘1’. Combining them in the INDIRECT formula would lead to the following formula. The formula in cell C4 is =INDIRECT("'"&$A4&"'!"&C$2&$B4) . 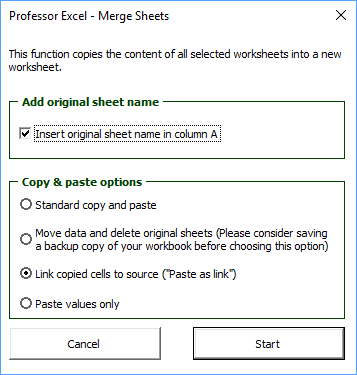 Copy this worksheet into your Excel file and all sheets are merged automatically. You want to save some time? We prepared a worksheet which can merge sheets automatically. What do you have to do? Download this workbook (~7 MB) and copy the only sheet into your own workbook. That’s it. Please note the following comments. This method requires to enable macros (a list of all worksheets in your workbook is automatically created). When you want to save your workbook, you will be asked to switch to the XSLM file format. This model works for up to 50 sheets with 200 rows each (10,000 cells are prepared). If you need more, you have to extend it. The reason for this restriction is that the file is already quite large and requires some calculation performance. You feel confident enough to use a simple VBA macro? Please insert the following code into a new VBA module. If you need assistance with VBA, please refer to this article. 'Instead of just paste, you can also paste as link, as values etc. You like to use the most convenient way? Try the Excel add-in Professor Excel Tools. Alternatively, you can further refine your desired settings: Do you want to add the original sheet name in column A? No problem. Also, define the copy & paste mode as shown in the screenshot on the right-hand side.